High pressure filter assemblies are a critical element to help protect system components from contaminants by removing debris generated by pump wear before it can damage valves or cylinders. 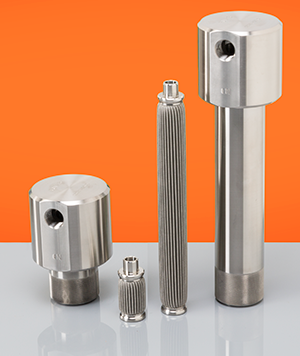 Swift-JB International high pressure hydraulic filter elements are manufactured from stainless steel. 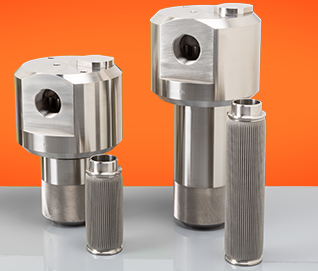 Our standard high pressure filter housings are 304 stainless, with 316, 17-4PH, Hastelloy® and other high performance alloys available. Swift high pressure filter elements are either nonwoven 316L stainless steel felt or wedge wire media. Metal felt filter media provides outstanding high pressure performance, with extremely high porosity (up to 85%), high flow rates and very long life. Wedge wire media is also ideal for many challenging filtration applications. Proven in the extreme environments of the offshore oil industry, these high pressure T-type filter assemblies are available to provide reliable service in any high pressure application whether for hydraulics, viscous fluids or gases. We also manufacture custom high pressure filter housings to specifications provided by our customers. Swift Filters also supplies low pressure filter assemblies for select industrial applications. Swift-JB International, LLC is a division of Swift Filters, Inc.
© 2015, Swift Filters, Inc. | Swift-JB International, SWIFTFELT, SWIFTLOC and Four-2-One are trademarks of Swift Filters, Inc.